There’s a cautionary tale inside the hype of medical transcription as a career and that is that there are a lot of scams. There are scam schools and there are scam jobs. Let’s focus on another shady area of transcription: the “certified medical transcriptionist.” I’m going out on a limb and expressing my opinion that any organization, other than AHDI, that claims it awards a “certified medical transcriptionist” or “CMT” designation or “credential” that is recognized in the industry is a scam. And I find this practice so reprehensible that I’m going to name names. This is a real-life story about how these scams and substandard programs affect individuals. I’ve also used her real information, with her permission – she’s made no effort to hide who she is online and a search will bring up several of the complaints she’s filed in the online media. It’s difficult (but obviously not impossible) to find out what a web site used to look like. I’ve included what I feel are pertinent screen shots of the old web sites for the companies I’m discussing, but there are gaps and I can only piece things together based on the information I’m able to obtain in the internet archives. I’m not going to claim that I have all the information – but I think I have enough of it to support the conclusions. If you’re having trouble seeing the screen shots, click on them for the full-size version. Like everything else on my blog, these are my opinions unless otherwise stated and referenced. Cathy thought she did her homework. She investigated medical transcription and medical transcription education. She chose TechSkills, a vocational school with multiple programs and locations in multiple states. …staff evaluates program and teaching location applications, advertising, enrollment and school catalog documents, refund policies and financial statements. Approval is granted after a school has submitted all required information and forms and the school is in compliance with state law. The state establishes a standard and makes every effort to ensure that a school meets the standard. They respond to complaints. They are also supposed to monitor a school’s success rate; i.e., whether students are graduating and getting jobs. This all kind of begs the question: who is watching the watchers? The program also prepares our Students for the Certified Medical Transcriptionist exam, which enables them to earn a widely recognized industry certification. They don’t say who performs this certification, but as Cathy found out – it wasn’t AHDI. I’m going to put that part of the story on hold for a minute, however, so we can finish up with TechSkills and move on to the organization that was administering the referenced certification. The reference to the certification appeared some between January 2004, when the site looked like the screen shot below, and January 2005 (screen shot above). …with access to a professionally-certified instructor in person, via telephone or electronically. I can’t find any information at the current TechSkills site about their instructors, including what professional certifications they might have. In fact, Cathy tells me that the instructor at the time she took the course was a recent graduate with no medical transcription experience. Am I being too cynical if I wonder why they aren’t terribly forthcoming with this information? Fast forward to December 2007. Somewhere in this time frame, TechSkills changed their web site. In November 2006, AAMT (now AHDI) sent a letter to TechSkills, notifying them of the misuse of “certified medical transcriptionist” and “CMT” and requesting that they stop using the terms, as the use implies that individuals have actually received the industry-recognized credential and it’s confusing. In addition, Cathy responded to the schools’ feedback form for graduates, and indicated that she had contacted over 50 employers and 48 of them had never heard of the organization issuing the “certification.” She was told by prospective employers not only is the NHA certified not widely recognized; it is, in fact, not worth the paper it’s printed on. As you can see, the site now specifies that the Certified Medical Transcriptionist (CMT) exam is through AHDI. But wait – there’s more! As those of us in the industry know, new graduates are not eligible to sit for the CMT exam. Just this year, AHDI sent TechSkills correspondence and informed them that this is misleading, as students and post-grads are not eligible to sit for the exam. You’ll also prepare for the Registered Medical Transcriptionist (RMT) exam, enabling you to earn a widely recognized industry certification from the Association for Healthcare Documentation Integrity (AHDI). Going way, way back in time, it appears that TechSkills started out as a computer technology school and then branched out into other vocations some time in the early 2000s. 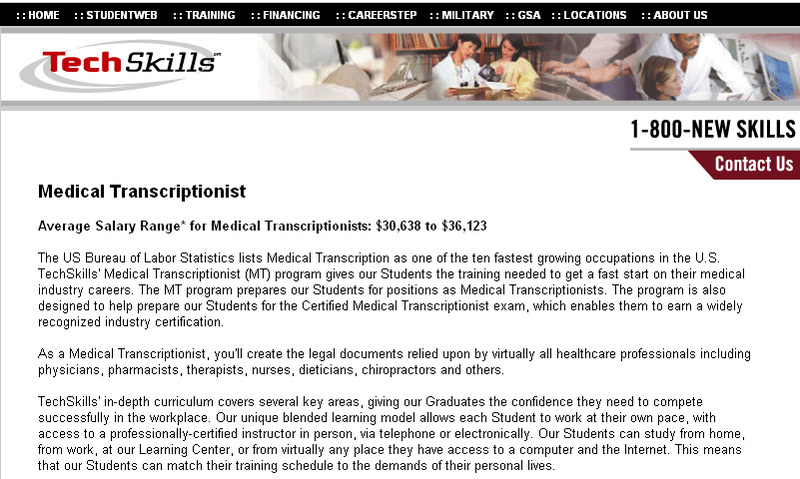 So what about that”certified medical transcriptionist” or CMT? How can you be a “benchmark” when nobody has heard of you? I called a couple HIMS managers I know, at large hospitals (including a couple University medical centers) and none of them have even heard of this organization or its certification. I called several clinics, with the same results. I like the broad ambiguity of this statement. It doesn’t say these organizations require the National Healthcareer certification – but since NHA has “national certifications,” it is implied, in my opinion. Even if we ignore that, the statement is patently false. Let’s look at the administrative healthcare certifications offered through NHA. Medical transcriptionist – no brainer. We all know there’s no certification required; most of the time, it isn’t even preferred. Billing and coding specialist – hospital coders are usually required to have the AHIMA credential. Medical billers aren’t required to have a certification of any kind. Certified medical administrative assistant – not required in any office I’ve ever been in, in any state. The matter could be resolved in court, but that costs money and AHDi doesn’t have any spare cash. So – it appears that the folks over at NHA will continue to cash in the bucks by offering a credential that is worthless in THIS industry. I called TechSkills today and said I wanted information about their program and fees. Apparently, they’ve learned some things, but not as much as we might think. The individual I spoke to actually had to rustle around in papers to provide me with information. I guess this gets confusing when you offer so many different programs at so many different locations. He even had to look up how much the medical transcription program costs. Are you sitting down? $7400. Yep, you read that right. I have been researching MT school tuition for another article I’m working on and the only AHDI-approved schools charging anything close to that are the universities and colleges – and that’s the out-of-state tuition. The other is offered by a little network in the industry, so it’s preferred. He also told me that both are valid and both are well known. Well, I’ve been in the industry for over 20 years and this is the first time I’ve ever even heard of NHA. In addition, TechSkills has an NHA testing center in their facility, with a monthly testing schedule, and graduates can arrange to take the NHA test there. In my opinion, that’s still an endorsement of NHA certifications, in spite of the fact that it wouldn’t be difficult to prove to them that the NHA “CMT” is worthless to aspiring transcriptionists. What I would like medical transcription hopefuls to learn from this is that there is only one organization offering any credentials that are recognized in the medical transcription industry, and that is AHDI. Cathy is trying to find other graduates from TechSkills, as well as others who have received the NHA “CMT” so she can start a class action lawsuit. The clock for her is ticking – the statute of limitations on her claim runs in a month. These sort of practices affect both individuals and the industry. I’m helping Cathy spread the word and get her class action together because she lost a lot of time and money in this process. Interested parties should Contact Cathy directly. (Her e-mail is included with her permission.) If you have any questions, please comment. How can at-home professions be a scam school when they are on the BBB? I would have to agree completely about never hearing the name NHA before last week when I had an inquiry to the [email protected] email that mentioned it. I’m actually going to go back to that email and refer the person to this posting so that they can read and make an informed decision about the NHA program and credentialing that they offer. Thank You Allison. Boy, this is alot to take in. I thought I had everything all planned out, and now that I am taking my final examination and am ready to become credentialed, I just don’t know where I stand. I became a member of NHA because my school, At-Home Professions, said you could become credentialed immediately and not wait the 2 years like at AHDI. I have an above average GPA so I thought I would give it a shot. I was also just informed last month that I have taken the longer, harder course offered for Medical Transcription at At-Home Professions. My school claims not just approval in its state but also accredited by the Accrediting Commission of the Distance Education and Training Council, as well as the BBB. It also does state being an affiliate of NHA as well as being an institutional member for AHDI. I hope this means I wont have a problem becoming an RMT through AHDI. I know this article concerns becoming credentialed, but it is through the inquiries I have done for this process that I realized my school might not be so good, although I feel I am ready to enter the Medical Transcription field. The instructors I have dealt with are actual Medical Transcriptionists with numerous years experience, and the graduate counselor has many years experience and will help me throughout my career. I put alot of thought and research into picking this school, so I really hope I made the right choice. By the way, in the section my school talks about these credentialing associations, they do talk about AHDI first and list all the same info as for the NHA site, ie., web site address, phone, etc. Back to the credentialing, I contacted NHA and did recieve a response. They tell me that NHA certification is accepted Nationwide and has currently been accredited by the NCCA for its plebotomy program. They go on to tell me that this accreditation brings much credibility to the NHA and the certifications it offers. They do say that while they are sure there are some agencies that do not recognize the certification through NHA, it is widely acceptable in a variety of allied healthcare settings. So, I thank you Allison. I guess I made the wrong choice in which place to get credentialed and should of stuck with AHDI. I am going to try to get my membership fees back as I feel that I was misled on their site. I would need that at the moment to join AHDI. Going through school, not working yet kind of makes for low funds. It does seem to me that they are on the right track and will become more widely accepted in the future; however, I want something that is accepted Nationaly right now! So do you think it is possible for TechSills to be a scam school and not At-Home Professions? As I read it, I am figuring that the schools are in the same state, not necessarily affiliated. I do know that At-Home Professions is a sister school to Kaplan and they advertise that you can transfer your credits over to them and continue on education through Kaplan. I also got my certification through the NHA, for phlebotomy. No one has ever heard of them I feel sick to my stomach. All the lost time and it is not worth the paper they printed it on. What do we do? Test at another “accredited” organization? I’m currently prospecting At-Home professions. To achieve a worth while career. I attended a seminar. I do want to go ahead and give it a try but eveyone around me are stressing me, telling me to make sure that it isn’t a scam. So my question is pretty simple. Is or isn’t At-Home Prefessions, a scam? Or is it a legitiment distance education program? Are there any web sites or contacts I may be able to get a hand on as to further my desicion on whether or not I should give this a try?